Have you always wanted to go on a trip to Vegas, but the budget just does not seem to allow that? Well, that’s nothing unusual, luckily online gambling industry allows you to feel tha same gaming environment directly from your computer! 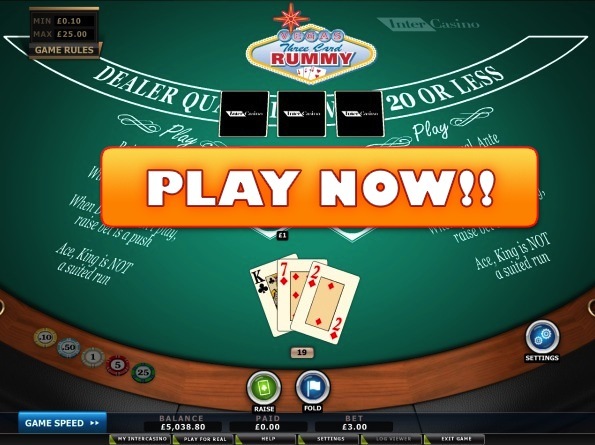 Vegas Three Card Rummy is a very popular game in Las Vegas Casinos and now also at online sites. The game can be played at Cryptologic powered brands. Rules wise, the game plays similarly as Three Card Poker – both sides, the dealer and player gets three cards dealt, which are also valued as per poker rules, except for aces that are always low (1).Ok, well actually that might be the only thing that is similar to that poker game, as in this rummy game you aren’t looking to get the highest poker combination, but rather a point score. It’s also the other way around for this rule, as the lower your hands point score is, the better. Lets get the rules structured in an easy to view/read way. There are three wager types in Three Card Rummy – ”ante”, ”bet” and ”bonus bet”. To get started you will have to place the ante, which will lead to three cards being dealt. This is where you have to re-evaluate and decide whether to put up an additional bet or fold and give up the initial ante. Remember: Cards are valued as per their face value – 2 to 10 are worth their numbered value, all face cards are worth 10 points and aces are always 1 point. Pairs always counterfeit the value of those two cards, if you got a pair in your hand, those two cards are worth 0. Three of a Kind counts as 0 points. Runs of at least two suited cards count as 0, except for AK suited. A run is two consecutive suited cards dealt – for example, 5 of hearts and 6 of hearts is a run, thus is worth 0 points when dealt. Dealer qualifies, when his hand point score is less than 20. As you imagine he will qualify quite often, but it’s not all that rare for him to take two face cards and miss out. What happens if the dealer does not qualify? Well, if you hold a better hand, your ante bet will be pushed, while your ”raise” wager will be paid out at 1 to 1 odds. There also is a bonus bet, which can be played on, separate from any other wagers. You can earn a payout of up to 100 to 1, if you get a run of A23 and have placed a wager on this bet type. Here’s the payout for bonus bet. Note dealer will have to qualify for these payouts to be accurate. Regular (raise bet) payouts in Vegas Three Card Rummy completely depend on your point score and will only be awarded when the dealer holds a qualifying hand. To refresh your memory, he qualifies whenever he has 20 points or less. Ante Bet is always paid at 1 to 1 odds, if you win and the dealer qualifies so these payouts are only accurate for the raise wager. The maximum payout in the game is $20,000,000 – yes, $20 Million! That’s more than any other online casino game has ever paid out. The basic strategy for Three Card Rummy is to use the same rule as the dealer – you should always continue in the game when holding a point score of 20 or lower. Otherwise, you should always fold, when the hand value is 21 or higher. You’re ready to play this game for real money online or well, for free if you want to! CryptoLogic and Real Time Gaming casinos both have it on the offer. If you are a Non US player, I would suggest to join Inter Casino who will match your deposit with a 100% bonus, up to $500 right away. CLICK HERE to Join InterCasino Now!